Day three at the Canadian Mixed Doubles Trials saw some separation develop in each of the four pools. The very tough Pool A features Kaitlyn (MB) and Connor Lawes(ON), KaLyn Park and Charlie Thomas (AB), Jenna Loder and Joshua Heidt (AB), last year’s champion Robert Desjardins with Brittany O’Rourke (QC), last year’s runner-up Dustin Kaltoff and Nancy Martin from Saskatchewan, along with three other quality teams. It is tough! Park and Thomas lead the pack right now with an undefeated record but are followed closely by three teams with only one loss: the Lawes team, Loder/Heidt, and Kalthoff/Martin. This will be a dog-fight to the end. In Pool B, Adam Casey and Marie Christiansen (Newfoundland) lead the way with an undefeated record. They have gone to last rock in every game with two extra ends but have managed to squeak out wins each time. They have the unusual attack plan of having Marie play rocks 1 and 5 throughout the game, but switch the order in an extra end. It is working for them so far. They are tied for first with Mike Armstrong and Ashley Quick (SK), who are also undefeated and the third team here to record a six-ender earlier today. Scott Howard and Tess Bobbie (ON) are close behind with only one loss. Pool C is another fight for top spot. 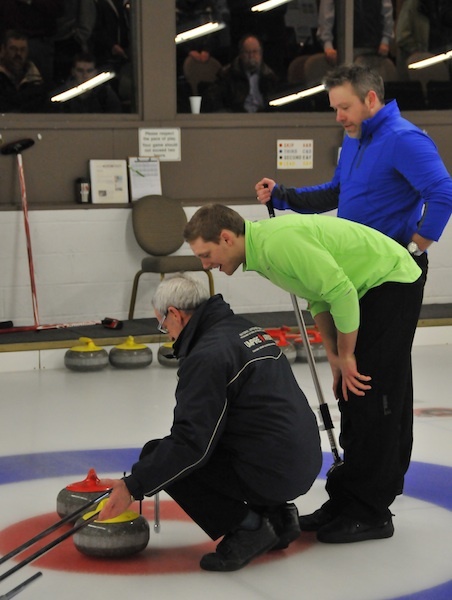 Two teams are undefeated so far – Travis Fanset and Rachelle Vink, along with the Ackerman husband and wife team (Jason and Colleen). 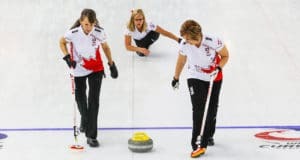 They are followed closely by two teams with only one loss, Wayne and Kim Tuck (Ontario) along with Patrick Janssen and Clancy Grandy (also from Ontario). Clancy’s last shot tap in an extra end missed by a hair tonight to give them their first loss. This pool is playing well. Pool D is led by John Morris and Heather Smith with an undefeated record. Two teams are close behind with only one loss – Mark Kean and Mallory Buist (Ontario), and Chris Jay and Shannon Key team also from Ontario. Tomorrow’s last five draws starting at 8 a.m. will be the deciding games as 12 teams will move into the Playoff round. The first round of playoffs starts Saturday night at 9:30 p.m. The Ottawa Hunt Club has been an outstanding venue for this event. Everyone is enjoying the competition and the hospitality of the club. 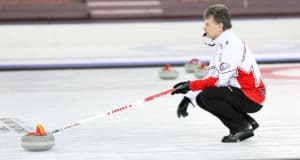 Head Ice Technician, Bill Duck has provided a terrific ice surface while Head Official Brett Waldruff from Calgary has kept the competition running smoothly. 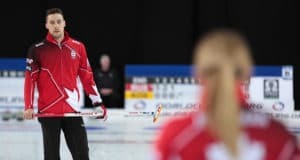 The Canadian Trials competition format consists of 32 teams (each team consists of one male curler and one female curler) divided into four pools of eight, with the top two from each pool after the round robin plus the four teams with the next-best records advancing to a 12-team single elimination playoff. The gold-medal game is scheduled for Sunday at 5 p.m.